Two White-tailed Eagles have successfully fledged in Ireland for the first time in over 110 years. In the last week the two birds were seen away from the nest and yesterday both chicks were seen flying near the nest on Lough Derg near Mountshannon, Co Clare. This pair also created history in 2012 when they nested for the first time. It is another significant milestone in the long arduous effort of restoring these magnificent birds to Ireland’s wetlands and coastline. These are the first Irish born chicks of the high profile reintroduction programme which began in 2007 with the release of young Norwegian eagles in Killarney National Park. The White-tailed Eagle reintroduction programme is managed by the Golden Eagle Trust in partnership with, and funded by, the National Parks and Wildlife Service of the Department of Arts, Heritage and the Gaeltacht. Over the coming years we enthusiastically expect that of the 10 territorial pairs of White-tailed Eagles that have been monitored and located this spring between Cork and Galway, they will nest, lay eggs and hopefully rear young. Other maturing birds, released in recent years are also likely to augment the breeding population over time. It is hoped that in time these Irish bred chicks, from Lough Derg, will survive and breed themselves in 2017 or thereafter. All White-tailed Eagle and Golden Eagle breeding attempts are prone to natural failures, over the long 4-5 month breeding season and can encounter a range of constraints and obstacles. Young pairs of breeding eagles are prone to failure before they gradually gain the wide array of skills required for successful breeding. These skills include nest building, continuous uninterrupted incubation, maintaining female body condition and continuously provisioning chicks with regular live prey. This year 3 White-tailed Eagle pairs attempted to breed and laid eggs in Counties Kerry and Clare. One pair failed toward the end of the 6 week incubation period. This pair is still on site and hopefully in a mere 6 month’s time they will begin to breed again next spring. Another pair that nested in Killarney National Park hatched at least one chick which survived to within 3-4 weeks of fledging. But it was very disappointing to find that the new nest had collapsed causing the death of the chick, shortly before it was due to fledge. It seems likely that the nest material (vegetation, sods and dead branches) dried out and shrank significantly in the recent dry spell of weather. The Mountshannon nesting pair also faced its own problems before the two strong chicks took to the skies. As part of the plan to enhance the security around the well known nest site and increase public awareness of eagles a camera was installed near the nest and several branches were removed. This allowed for the continuous guarding and monitoring of the nest from a safe distance on the Lough shore. These changes apparently triggered a negative response from the adults and the adults only flew near to the nest subsequently, without landing on the nest. The well grown chicks were provisioned with food on the nest and subsequently fledged in great condition and at the anticipated date. The two chicks are expected to stay around the islands and western shoreline of Lough Derg, north and south of Mountshannon, for the coming weeks with their parents. Sometime in the autumn these juveniles will leave their parents’ territory and begin a 3-4 year nomadic life before settling in their own separate territories before attempting to breed themselves. The eggs were laid in County Clare in late March. The Mountshannon breeding adults, a five year old male and four year old female, were both collected on the island of Frøya, off the west coast of Norway. This pair laid eggs in 2012 but failed to hatch chicks. However by January 2013 they had already built a new nest. Despite all the problems and setbacks Irish White-tailed Eagles have endured since they were first released in 2007, they continue to make important incremental steps each year, as part of the long term restoration project. The challenges facing fishing or hunting birds can be periodically difficult as can the challenges facing breeding birds. But as the small Irish White-tailed Eagle breeding population grows, we can hopefully see these breeding birds gain experience and slowly expand their limited range. 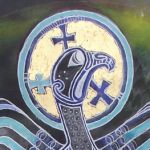 The Golden Eagle Trust would like to publically acknowledge the support of scores of individuals, volunteers, landowners, walkers and boating enthusiasts for their support and protection of territorial eagles from Galway to Cork, but especially in Mountshannon, Co. Clare and in Kerry. Despite a few incursions onto the nesting island by outside visitors, the local boating and fishing community in and around Mountshannon have been totally supportive and co-operative, which has been central to the successful fledging of these birds. 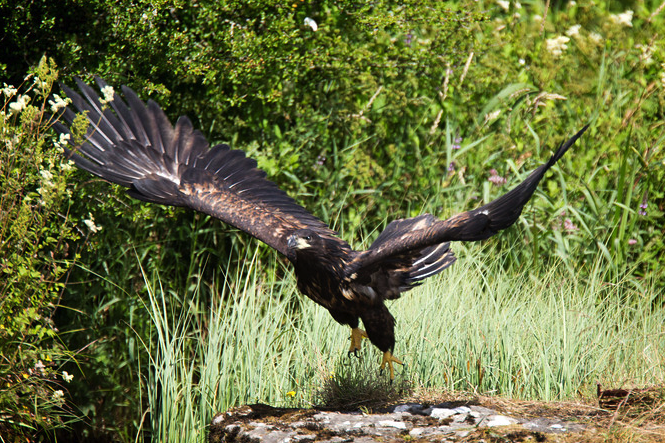 We hope more people can visit Mountshannon and hopefully enjoy the unique spectacle of a family group of eagles wheeling above the beautiful scenery of Lough Derg.